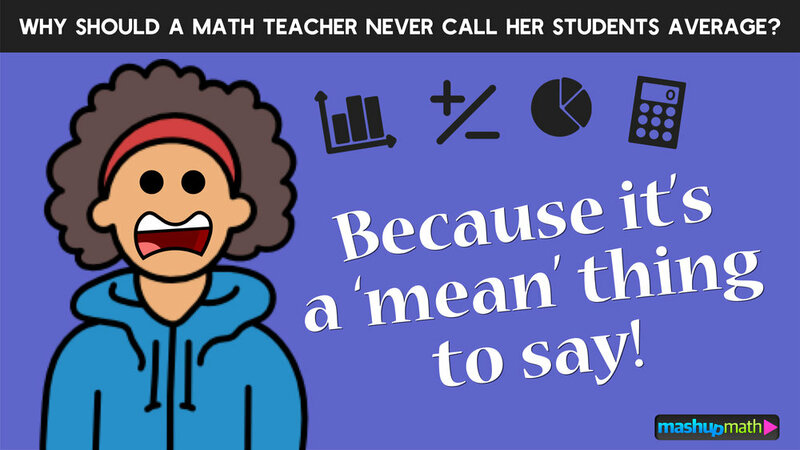 Are you looking for some funny math jokes and math puns to share in your classroom with your kids? 1.) What do you call a group of dudes who love math? 2.) Did you hear about the mathematician whose afraid of negative numbers? He’ll stop at nothing to avoid them. 3.) Why was the number 6 afraid of the number 7? 4.) Are Halloween monsters good at math? Not unless you Count Dracula. 5.) Why should you never start a conversation with Pi? Because he’ll go on and on forever. 6.) Why was the number 7 so over his job? 7.) Why did the student feel like life was pointless? Because she didn’t take Geometry yet! 8.) Why is it such a shame that parallel lines have so much in common? But only a fraction would understand. 10.) Why do plants hate math? Because it gives them square roots. 11.) Why did the student get upset when her teacher called her average? It was a ‘mean’ thing to say! Did we miss your favorite math joke, math pun, or math humor idea? Share your thoughts and suggestions in the comments section below! 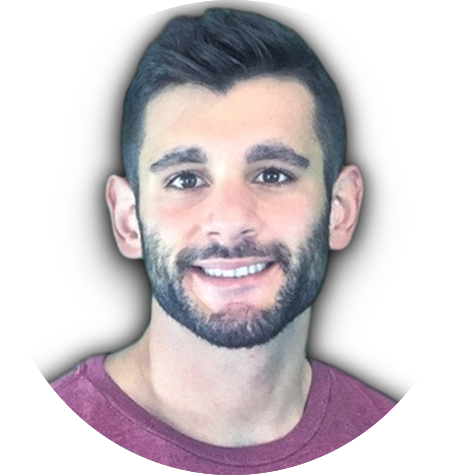 Capturing your students interest and curiosity during the first few minutes of class is the key to keeping them engaged for your entire lesson. But not all math warm up activities are created equally. 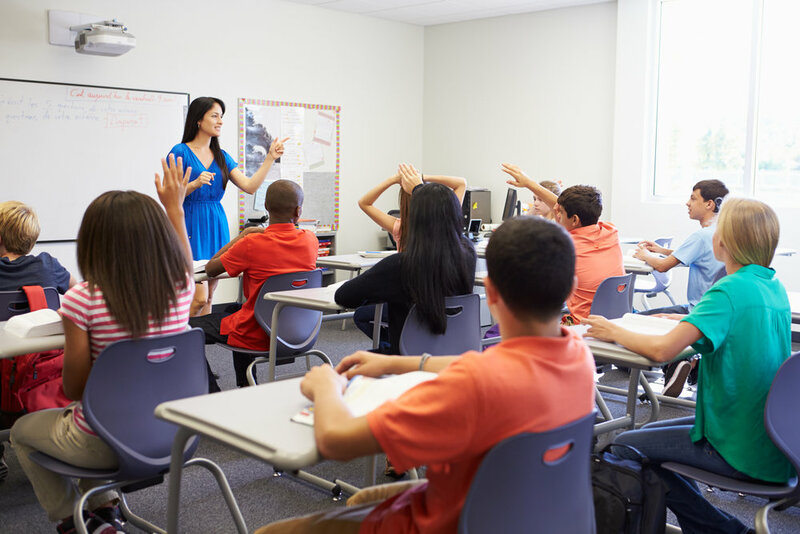 Math teachers miss out on activating their students’ critical thinking and reasoning skills when they assign routine, lower-level practice problems during the first five minutes of class. However, when you use the right mix of fun and though-provoking math warm up activities to start your lessons, student engagement spikes, as your kids will constantly be wondering about what is coming next. Two Truths and One Lie! 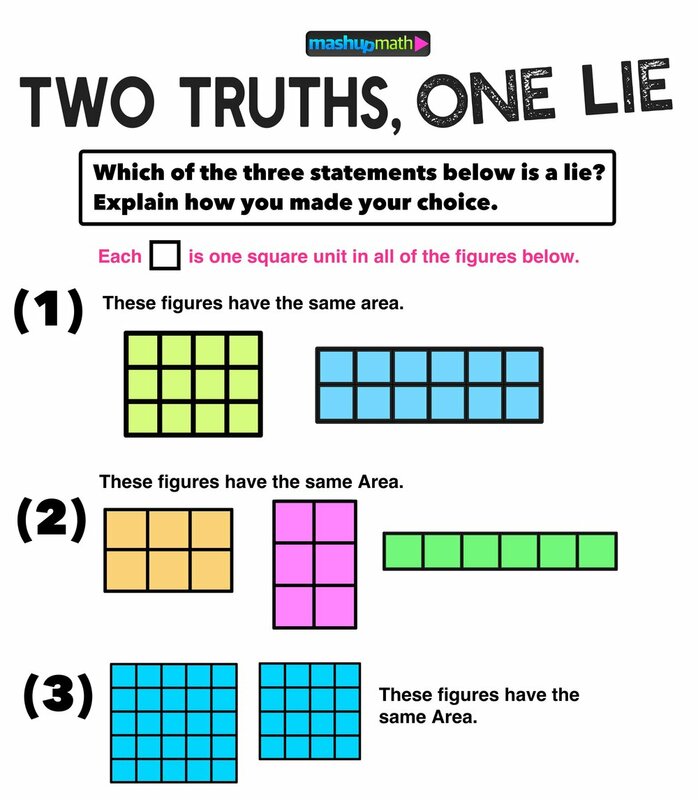 I recently started using Two Truths and One Lie (2T1L) activities, where students are presented with three mathematical statements (only two of which are true) and they have to identify which statement is a lie and justify why their choice is correct. The results? Pretty amazing. 2T1L taught me that my students love to argue and state their case (in small groups or to the whole class). In short, 2T1L is a fun way to spark deep mathematical thinking and open discussion at the start (or end—2T1L activities make great exit tickets) of any lesson. What topics/grade levels are 2T1L activities best suited for? 2T1L activities can be used for all grade levels and topics. The graphics should be topic/lesson specific and can include graphs, charts, and diagrams. Imagine how your students would react to starting class with one of the following activities. What kind of creative and mathematical thinking would spark? What kind of small or large group discussions would occur? How would a spike in engagement effect the remainder of the lesson? Looking for more for grades 3, 4, & 5? 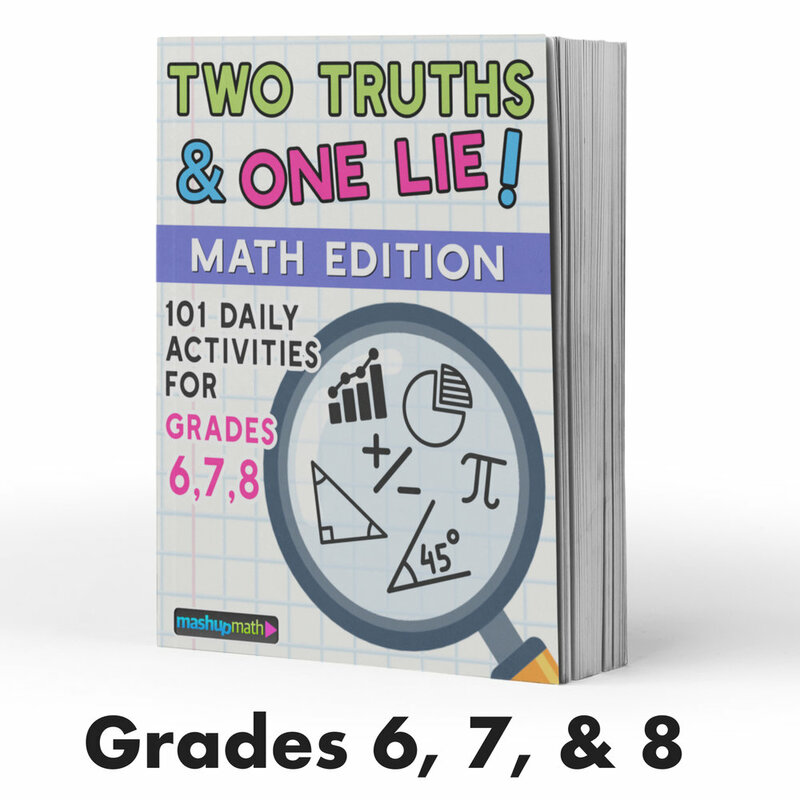 Download your 101 ‘Two Truths and One Lie!’ Math Activities for Grades 3, 4, & 5 eBook! Looking for more for grades 6, 7, & 8? 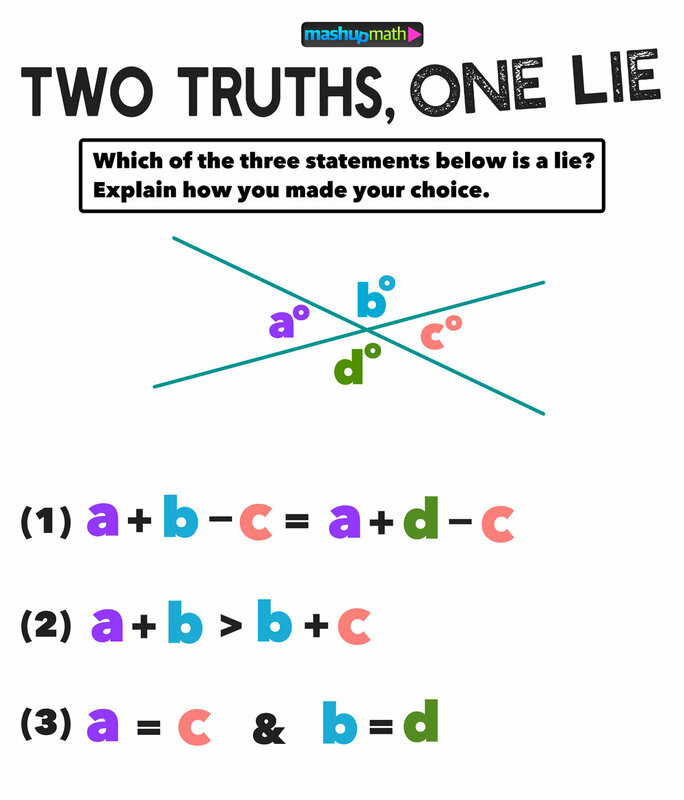 Download your 101 ‘Two Truths and One Lie!’ Math Activities for Grades 6, 7, & 8 eBook! You can now share 101 Daily Two Truths & One Lie! Math Activities for Grades 3, 4, & 5 OR Grades 6, 7, & 8 with your kids with our brand new PDF workbooks! 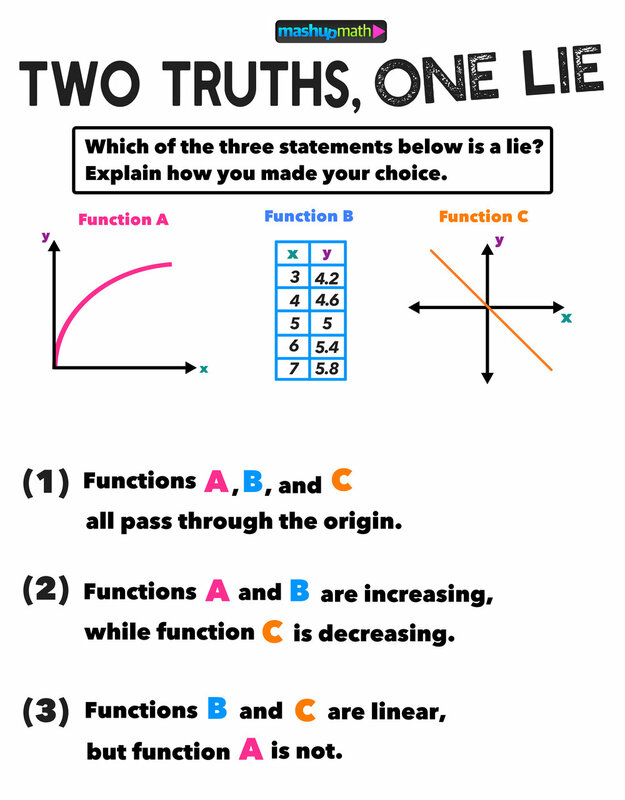 Do you have experience using 2T1L activities with your math students? Share your thoughts and suggestions in the comments section below!